“Properly practised, knitting soothes the troubled spirit, and it doesn’t hurt the untroubled spirit either.” Elizabeth Zimmerman. My older sister, Nell, is a formidable knitter, socks and fingerless mittens being a speciality. 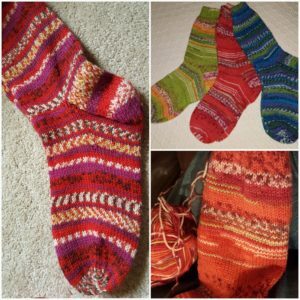 She designs her own patterns, does weird things called provisional cast ons, and waxes lyrical (and at great length) about the pros and cons of picot edging versus rib. I’m not sure whether Nell’s spirit needs soothing but I am convinced that she views knitting as an intellectual adventure. Without knitting, her hands would probably be picking away at the wallpaper in the pub where she and her compatriots currently meet for a ‘knit and natter’ session. Social engagement is a wonderful by-product of most crafts, particularly the portable kind like knitting. My younger sister, Annie, couldn’t knit. Over the years many people (including me) of varying experience in knitting and/or teaching have tried to help her overcome this handicap. All have failed. Whereas once Annie took a kind of perverse pleasure in her ability to ‘break’ experts, just recently she has found herself in some situations where the calming effect of knitting would have been welcome. Now that I am doing some sessions as a mentor of creative practices (more on this next month), I decided to volunteer my services again. Curiously enough, stepping away from my previous skills of teacher/tutor/educator and instead using those of a mentor/guide/companion was all it took for Annie to stop thinking in terms of success or failure. 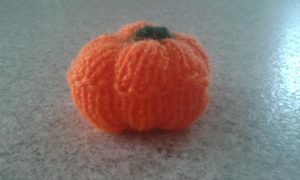 Her woolly pumpkin is the end of her being willing – even happy – to say “I can’t knit” and the beginning of a creative journey that is full of possibility. 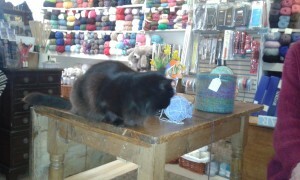 Nestling between the two extremes of sisters and their knitting skills, my wool and needles have a more niche setting. I use free form knitting (often called Scrumbling) to create deeply textured surfaces which act as a foundation for layered embroidery, embellishment with found objects and appliqué. This allows me to forget figurative representation and instead make some deeply personal and subjective interpretations of cultural geography. 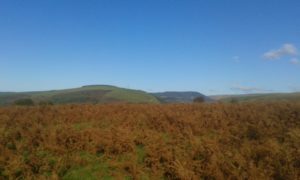 My current project is a continuation of my MA dissertation which involved mapping the metaphysical features of landscape through poetry and mixed media art. A book, creative walked journeys and a linked exhibition loom in 2019 so work has started on a wall hanging called ‘Run!’. Incidentally, the title has nothing to do with dropped stitches and everything to do with the ill-fated attempt of the Silurian tribe of Glamorgan to escape the advance of the Roman army in the 1st century AD. 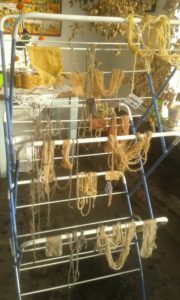 In an effort to make the knitting belong to the landscape it is representing I have done some solar dyeing with plant material harvested from the area. 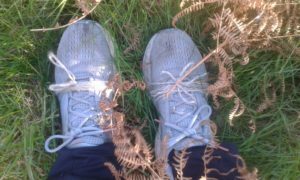 In addition I have been walking/running over the ancient paths of the the Glamorgan ridgeway with wool tied around my shoes. It gets nicely stained with what you could call indigenous dyes if you were being academic, but sheep poo is just as accurate a term. My doomed Silurians also had to climb a very steep ill in their efforts to get away. 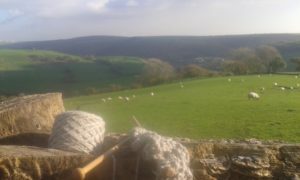 One afternoon last month I repeated their journey, threw a ball of coarse Welsh wool down the slope and then wandered after it, knitting as I went. 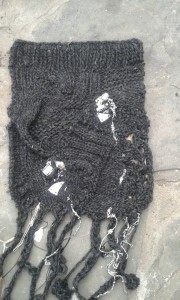 Anything that got caught in the yarn – moss, fleece and, yes, sheep poo – got knitted in. By the time this wall hanging is finished it will also have lines of poetry that will tell the story of a people who met their end within sight of their homes to the east and safe haven to the west. 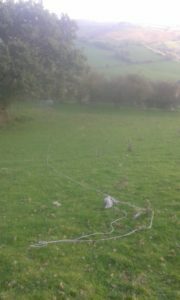 There is no picture which can convey that reality but I’m willing to bet that knitting will do it justice. Lots of towns, villages and communities have groups which provide support and facilities for crafters of all sort. My local area has established one to address everything from enabling artisan makers to counteracting social isolation by letting people learn skills from each other. (www.craft.bridgendreach.org.uk). There again, you could always join or start a yarnstorming brigade. You need to have mischief making tendencies for this sort of thing and established groups are likely to be suspicious of anyone trying to push their way in.